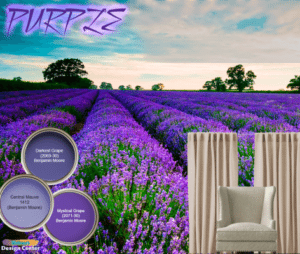 The purple color pallet can add an array of color options in both modern, contemporary and traditional interior spaces. Purple is also the most powerful wavelength of the rainbow and is considered rare in nature. Light-hues of purple can often symbolize something light hearted (love, floral, etc) while dark purple aligned more with royalty and power.